MIAMI -- His face pale and eyes squinting, Frank Vogel leaned over a laptop in the middle of the nearly silent Indiana Pacers locker room. "Freeze it," Vogel whispered to Jhared Simpson, his video coordinator who worked the mouse as it broke the harsh truth. "Run it again." Less than 5 feet away Roy Hibbert bowed his head and silently stared at his phone as text messages poured in asking him why he wasn't part of the play Vogel was studying. Without saying another word, Vogel straightened and marched off to accept blame for his team's Eastern Conference finals Game 1 loss to the Miami Heat 103-102. LeBron James won the game with three MVP-quality plays in overtime. There was a rebound that, in addition to securing a triple-double, led to a three-point play. Then those two driving layups in the final 10 seconds  one to his right and one to his left -- the second of which gave James one of those uber-valuable buzzer-beating shots that are requisite in a Hall of Fame résumé. LeBron 1, Pacers 0. Robert Mayer/USA TODAY Sports Just another day at the office for LeBron James. Then there was Vogel, feeling like he might've lost it, taking out rim protector Roy Hibbert for both those possessions as James plunged a dagger into the strategy. Just before the last play with 2.2 seconds left, Vogel screamed for a timeout to change his lineup, rushing Tyler Hansbrough to the scorer's table to check in for Hibbert when he saw the personnel Miami had in the game. It had been just a few minutes of real time since the same decision burned him, but he did it again. Hibbert marched to the end of the bench, away from the huddle and biting his lip. "I would say we'll probably have him in next time," Vogel said. That will be what limits Vogel's sleep until Friday's Game 2. What will keep Hibbert up will be that he said nothing about the decision. As he said it, Hibbert reached his long arms into the air to demonstrate the easy layup James got at the buzzer, exaggerating it in frustration. "I trust coach's judgment," Hibbert said. "Somebody should've been there to contest the shot, you can't let the best player in the league roll to the basket." Pacers' forward Sam Young was near the rim but didn't even jump. But Young is no Hibbert. Paul George, the Pacers' savant defender and near hero after a clutch 3-pointer in regulation and three free throws in overtime, made the mistake of taking the wrong angle on James. Paired with Vogel's coaching decision, that was it. A tightly played game was decided just that fast. Currently, at the absolute height of his powers and confidence, giving James an inch is giving him the game. When Vogel gets the statistical analysis, he's not going to feel any better. James played 47 minutes in Game 1. 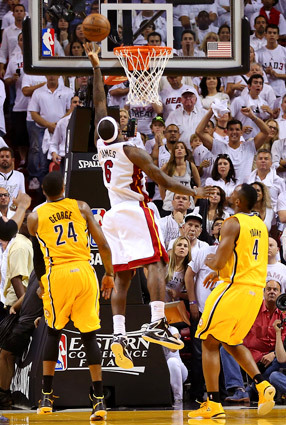 He played 38 of them with Hibbert on the floor, and in that time, James took three shots within 5 feet of the rim. In the nine minutes James was on the floor with Hibbert on the bench, he took six shots at the rim and made four. The results of the final 10 seconds provided enough data, though. "[Hibbert] does an amazing job of protecting the rim," George said. "I'm 100 percent sure he would've been there." The Pacers players restrained themselves somewhat from questioning their coach, but they just couldn't help it. In the corners of the locker room, you could hear about the "Melo play," a reference to Hibbert's devastating fourth-quarter rejection of Carmelo Anthony in the closeout game of the Pacers' series with the New York Knicks. • 5-on-5: What to make of Game 1? That play broke the Knicks, and the visual of Hibbert's hand stopping Anthony's dunk has quickly become iconic in Indianapolis. It was a poster in Wednesday's editions of the Indianapolis Star and now surely graces the walls of cubicles and bedrooms across Indiana. The image Wednesday night, though, was of James' free layup just before the red lights flicked on. The reason Hibbert was on the bench, giving a glassy-eyed stare, was Vogel was worried about Chris Bosh. With the Heat playing small with Bosh acting as center and Shane Battier acting as power forward, Vogel was worried about Bosh getting open for a jumper with the slower Hibbert on him. This is a major crux point in the series, just how the Pacers would deal with these situations. When their slow but tall 7-foot-2 centerpiece who helped them become the NBA's best defense has to worry about defending a man who can shoot 3-pointers, what can they do? Vogel estimated this would be an issue for about 15 minutes a game, the time when Bosh truly plays center and Hibbert can't defend closer-to-the-basket players such as Udonis Haslem and Chris Andersen. The problem is it will probably always be an issue in the final minutes and crucial possessions of this series. This is one of the major reasons the Heat are so good -- now 46-3 since losing to the Pacers on Feb. 1: this spread-the-floor ability. The Pacers spent a lot of time pondering this over the past few days. "If LeBron drives one or two steps, I think he has a chance at the basket, so I come over and then dishes to Chris Bosh, who has been torching us from the perimeter the last three or four games we played them," Hibbert explained. "Coach's mindset was everybody play everyone 1-on-1. They could've scored even if I was in there. Or I could've blocked it." Two weeks ago when the Pacers were playing the Knicks, Vogel was asked how often during the season he's "matched down." In other words, how often as he gone to a smaller lineup when the opponent tries to beat the Pacers' size with shooters and quickness. As Hibbert points out, the result could've been the same even if Vogel stuck with the big guy. 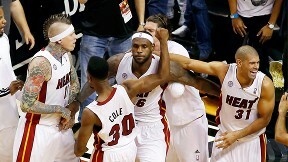 James could've dished to Bosh, who could've hit a game-winning jumper. That individual decision highlights what Vogel and the Pacers must ask themselves in this series. Are they willing to remove one of their biggest weapons, Hibbert's honed ability to patrol the high-value area near the hoop? Or will they change up the plan and live with Bosh or Battier getting open jumpers? How this plays out could affect who plays in the Finals because this hinted at being a terrific matchup that could have numerous games coming down to the final possessions. Perhaps the Heat will roll on from here as they're known to do. Or perhaps the Pacers will take this lesson and make an adjustment that could change the outcome next time. "To tell you the truth, I cannot wait to play the next one," Hibbert said. "It's a physical series, and we're going to be go punch-for-punch, blow-for-blow, and this is fun to me." MVP: LeBron James. Despite not being as impressive as we've seen for the full 48 minutes, he scored 30 points on 24 shots and made an incredible move to win the game. That alone says something of our expectations. His drive to win will go down as one of the greatest plays of this postseason. X factor: Paul George. He struggled to make shots early but hit a 3-pointer to force overtime and then made 3 of 3 clutch free throws to set up Indiana for the win. His last-possession defense on LeBron was questionable, but the game never gets that far without him. That was ... entertaining: Common wisdom said that the Heat are clearly the better team, but the Pacers dictated the style of Game 1 in many ways in Miami. We might be in for a long series where each game comes down to the wire. LeBron capped off his ninth career postseason triple-double (30 points, 10 rebounds, 10 assists) with a buzzer-beating layup in overtime to give Miami a 1-0 series lead. Where's Roy? Remember Roy Hibbert's earth-shaking block against Carmelo Anthony in the East semis? Apparently Pacers coach Frank Vogel has a short memory, as he left his 7-foot-2 big man off the floor for the game's final possession. "I would say we would probably have him in next time." -- Pacers coach Frank Vogel, on sitting center Roy Hibbert on the final play of overtime. Mike Ehrmann/Getty Images Without Roy Hibbert patrolling the paint, LeBron James had no trouble driving in for the game-winning layup in overtime. LeBron James registered 30 points, 10 rebounds and 10 assists to lead the Heat to a 103-102 Game 1 overtime victory over the Pacers on Wednesday. James is only the third player in NBA playoff history to record a triple-double in a one-point win. The other two players to do that were New York's Walt Frazier -- who had 10 points, 14 assists and 12 rebounds in a 112-111 win over Milwaukee on April 13, 1970 -- and Boston's Rajon Rondo, who registered 13 points, 17 assists and 12 rebounds in a 92-91 win over Philadelphia on May 12, 2012. James was the only one of the three who hit the game-winning basket.